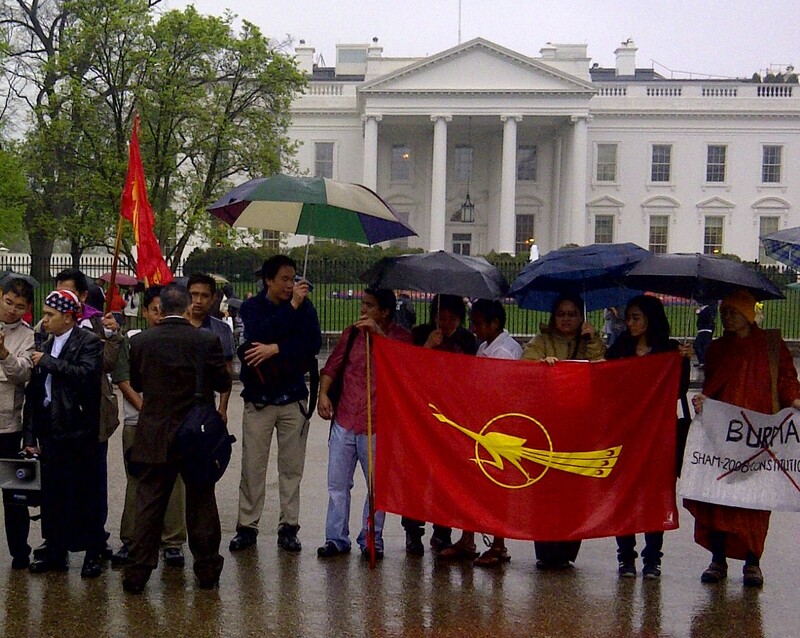 Protest on March 24, 2012 by members of the International Foundation for Burma National Congress (IFBNC), outside The White House. Washington, D.C. Photo Credit: Genevieve Neilson. Myanmar’s April 1 by-elections are over, but tensions and uncertainty still hover – will the National Democratic League elected officials be able to maintain their seats within Parliament for the remaining term without military interruption? Will the new government be able to effectively pass progressive reforms despite the military grip on power? How will the celebrity of Aung San Suu Kyi impact the party’s effectiveness and foster an environment for a fair democracy? All these questions and more are swirling around the media, academia, and importantly are in the minds of the Burmese. The relatively smooth elections on April 1 were a positive sign despite corruption allegations. The next three years until the general election may seem like a decade if reforms move at a staggered pace. Lessons can be learned from Myanmar’s rich history, including its struggles with democracy, civil war and involvement of outside powers. The transitions of power between democracy and coups from the 1940s to 1980s demonstrate the perplexities in Burma/Myanmar politics and the ways that individuals and parties have tried to cling to power. In the early 1940s Aung San, Suu Kyi’s father, attempted to lead an ‘independent’ Burma free from British rule, Aung San and his colleagues courted the Japanese; they spent months training and fighting with Japanese soldiers and even wore kimonos during their flirtation with Fascism. Aung San wrote “There shall be one nation, one state, one party, one leader…there shall be no nonsense of individualism. Everyone must submit to the state which is supreme over the individual.” (Thant, 2006, p. 229) The slogan of the Burma National Army in 1943 while he was War Minister still reigns today – “One Blood, One Voice, One Command”. Luckily Aung San turned against Fascism just in time in 1946 to help Burma in its first democratic elections; however, he always held onto his belief in statism and the determination that his party’s views were best for the country. When Aung San negotiated with the Japanese and the British to enable an independent Burma, he demanded that his party automatically receive a majority in the provisional government council, with more rights than other parties and in disregard of ethnic minorities. In a way, Aung San eventually led the U Nu government to democratic power through the 1947 Constitution. Burma has yet to achieve sustained democracy; greed, corruption, military strength and politicians that feel they’re infallible have impeded its perpetuity. By the late 1950’s, Independent Burma’s first elected government under Prime Minister U Nu experienced a decline in influence. After ten years in power and in spite of electoral success, U Nu’s party began to break apart. The league had been a mixed grouping of competing interests, goals and loyalties, sealed by relationships at the very top. (Thant, 2006, p. 283) The friends and colleagues in government grew tired of each other and mutual confidence began to wane. The league lost much of its support and started to rely on extremist wings for continued support in Parliament, causing worry among the military. In September 1958, rumors of a coup d’état circulated; eventually forces under command of future NLD leaders surrounded the government buildings as a “preemptive coup”; several days later U Nu announced that he had asked General Ne Win to assume a “Caretaker Government” due to the current security status of the country, until new elections could be held. General Ne Win took over Burma with a military order for the second time in 1962; the ruling party had helped the country move forward and could not understand why the military-backed party didn’t gain the people’s trust for another term. The first military government used technocrats to rule effectively; the new military government, however, worked in an opposite way, distrusting and firing educated civil servants, academics, and others within the educated professional class. The government abolished many foreign aid agencies, international education exchanges, and closed Burma to the outside world. The effects of decades of inefficiencies, military rule and the path toward a totalitarian state by General Ne Win from the 1960’s to 1988 can still be seen and felt across the country. Rather than turning Burma into a national-socialist utopia, Ne Win turned it into one of the poorest and least developed countries in the region. Now with a civilian leader in charge – but strongly backed by the old ruling military order – the country may yet fall back into disarray come next election. A major difference this time, however, is that the world is watching and advocating for democratic normalcy and greater freedom, with its ASEAN neighbors and the US noting every step. When Suu Kyi returned to Burma in 1987 to take care of her mother, she also prepared herself for potentially having to nurse the country back to health. A strong and determined leader, she has claimed her place in history but is just getting started. Suu Kyi’s discussions with US Secretary of State Hillary Clinton, United Nations delegations and other diplomats demonstrate the faith and authority that the international community has in her opinion and commitment to a free Burma. It is amazing that Suu Kyi has made it this far despite assassination attempts, but the current leadership knows that they need to keep her placated to survive. Prior to the election, Joshua Kurlantzick wrote in Foreign Affairs that Thein Sein would actually be at a loss if Suu Kyi did not win her parliamentary seat; the international community and Burmese would not accept the election results as being accurate. In this way, one hopes Suu Kyi is in fact fostering a more genuine democratic spirit amongst military leaders. Suu Kyi has changed Myanmar’s fate, but can she continue to move the country forward? As much as Suu Kyi is the focus of the changing political landscape in the country, her party lacks enough parliamentary seats, internal experts and policies recommendations to peacefully develop the country; as well, they need to foster more leaders to counter the stubbornness Suu Kyi shares with her late father. Furthermore, a collaborative effort will be necessary to make the economic and political changes necessary to restore a collective national pride and governmental legitimacy. The NLD will need to keep its relations with the ruling government amiable in the same way that Thein Sein, the Union Solidarity and Development Party and the military need a peaceful environment with the NLD to maintain their status. All sides will have to compromise in one way or another to keep ASEAN on its side. The April 13 visit by British Prime Minister David Cameron to Myanmar is a striking sign that the West is interested in Myanmar’s development; that he decided to take a business group to investigate leaves me on edge that the country’s natural resources or economic market could potentially be ruthlessly exploited. The bilateral and multilateral meetings to come in the next few months should provide greater insight into how things will develop in Myanmar. The more unfiltered information sent out to the international press and the more access foreign press and nonprofits are able to gain within the country, the better. The international community no longer seeks to alienate the government of Myanmar but they must not let the state reign ‘supreme over individuals’. Aung San Suu Kyi, like her father, has found herself at an important precipice in Myanmar’s politics. The fragile balance that has emerged out of the most recent elections could point toward a more stable and more prosperous future for Myanmar’s people, but also looms at the edge of renewed military rule. The hope is that Suu Kyi and that NLD can navigate this situation without repeating mistakes of the past. *Note: this post uses the name “Burma” to refer to the time before the country was renamed “Myanmar”. The people of Myanmar are referred to as “Burmese”. Reference: Thant, Mynt-U (2006). The River of Lost Footsteps: A personal history of Burma. Farrar, Straus & Giroux, New York, NY.